Well that’s me back to reality after a two week holiday in Vietnam. I had a brilliant time enjoying the sights, smells (although not always) and food of Vietnam, from Hanoi to Saigon. I spent most of my time on an Intrepid tour with a great bunch of people and a friendly and knowledgeable tour guide. If you ever head to Vietnam and want to do it via a tour, I would recommend Intrepid. I had Vietnam on the bucket list for a while and it was great to finally see it. Now I’m not going to lie, one of the reasons I was excited about my trip was for the shopping, specifically for all things sewing related. Vietnam is known for its tailors, so I figured if it’s good for tailors, there would have to be plenty of fabric shopping opportunities also. I did some research prior online to find out where to go for fabric shopping so at each pit stop along my trip I headed to the suggested places. I also discovered some extra shops along the way. In my research online I did struggle to get a clear idea of where to go, what to pay, what you can expect etc, so I hope this post will help you if you make it over there. My first destination was Hanoi. Hanoi is a frantic bustling city and a bit of a culture shock when you first get there. On my first free day I wondered around the Old Quarter. It didn’t take long before I ended up in a street that had stalls upon stalls of sewing notions. Zippers, buttons, elastic and sequins. On the surface a lot of it looks like junk but if you are prepared to dig deeper you can find some nice things. One woman did attempt to sell me elastic trim with pleated gingham on it for $4 a metre; how do you say ‘are you having a laugh! ?’ in Vietnamese? The prices are dirt cheap over there, so I know she was trying her luck. Hang Gai Street is where to go for Vietnamese silk. I would suggest buying it from one of the tailor’s shops than in the market. Be familiar with the feel of silk before you go to know you are getting the real thing. I cannot begin to tell you how many people tried telling me silk was in fabrics that just by feel I could tell were polyester. Expect to pay about $12 a metre for silk. THE market for getting fabric was the Dong Xuan market. This place is a fabric mecca and pretty overwhelming! Head straight to the first floor which is dedicated to fabric. I found stall holders didn’t bother with you and you had to get their attention. Quite different to the other cities in Vietnam. Some stalls tried to sell me stretch cotton for $10 but I know if you haggle enough you could get it for half. I bought a few cottons for $4 a metre. Take a pad and pen and barter by writing down prices and be confident! Next stop on the fabric shopping journey was Hoi An. This place sells itself as the shopping mecca in Vietnam and I wouldn’t disagree, there are many many shops and pretty aggressive shop owners. Every second shop front here is a tailors and you can barely glance sideways without someone wanting you to go into their store. Even though I can sew myself and knew I would probably be a tailors worst nightmare as a customer, I thought I might bring a souvenir home and test their tailoring skills – so I had a dress sewn up. Our tour leader suggested BeBe tailors and they made a dress for me in 24 hours for $80US. You can get cheaper, but I think the old adage of quality and cheapness comes into play. I only had a picture to go on and in discussing with dress with them I could tell they weren’t picking up the finer details, i.e. princess seams vs darts on the bodice and trying to explain a lapped zipper instead of an invisible zipper. I was opting to make a vintage inspired dress, hence wanting a lapped zipper instead but the language barrier just wasn’t letting it happen so I know I didn’t get exactly what I wanted but the quality of the workmanship was perfect. It’ll do the trick for a work dress. I headed to the Cloth Market which is exactly what it says on the tin! 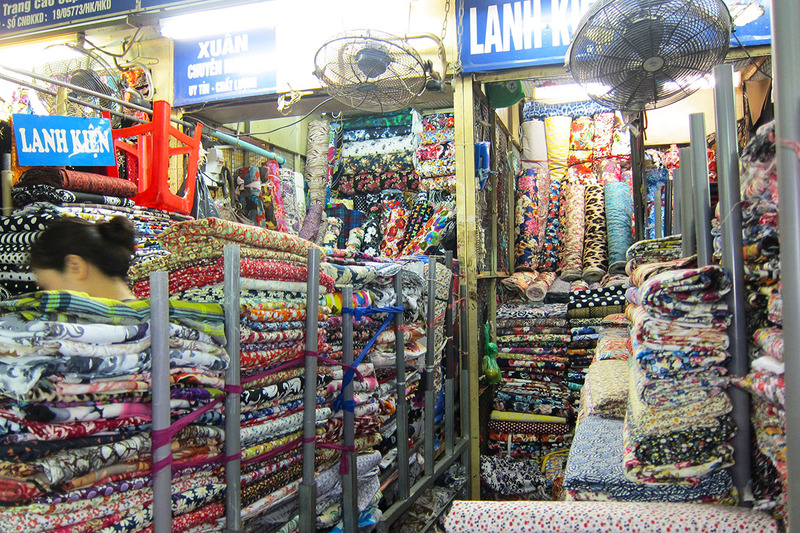 It is rows of stalls that not only sell fabric, but also tailor. The stall holders here are very different to Hanoi and bug you a lot. In fact I had one girl just follow me about the whole time. So word to the wise, be tough and barter barter barter. They are more up for the barter in this market. I bought most fabrics for $3-$4 per metre, all were cotton. There is a lot of chiffon and stretch polyesters if you’re in the market for them too. You could probably snag those for about $5 per metre. Most of the fabrics are 150cm wide so you do get more bang for your buck. They seem to have two different types of cotton in Vietnam. A stiffer cheaper feeling cotton and cotton rayon. The rayons are lovely so I bought mainly that type and I do find rayon harder to get in Oz. I wanted to pick up some Vietnamese silk whilst I was over here and found a shop in the old quarter of Hoi An breeding their own silk worms and making the fabric from them so I thought it would be a good place to buy the fabric! Check out 41 Le Loi Silk. Downstairs they sell embroidery, and upstairs the silk by the metre. Last stop on the Vietnam holiday was Saigon (Ho Chi Minh city). This is the largest city in Vietnam and the most modern. The traffic is intense – so look out! The biggest market and most well-known market there is Ben Tanh market in the heart of the city. I didn’t know if I’d find fabric there but I went to check it out. Unsurprisingly there was fabric. Much the same as the fabrics I had seen in previous parts in Vietnam. There are about two rows of stalls and most will sell their cottons for $3-4 per metre and there is quite a bit of stretch polyesters and sequin fabrics if you are so inclined. I even spotted a couple of fabrics I had seen in Spotlight back home. There was quite a bit of rip off Liberty print fabric too but nowhere near the quality of the real thing and I could never bring myself to buy fake Liberty. On the second last day I decided one more fabric trip was in order and I went to check out Tan Dinh market that is a little out of the city but very reachable by taxi. It was mentioned a few times on websites as the fabric market that local tailors go to and they aren’t wrong. When I got there it was evident it isn’t a place many tourists go to. All locals and little English. It is worth the trek though as there is a lot there and the prices are pretty decent. On top of that, across the street from the marker there are about 6 fabric stores with some great selections and most cottons were about $3 per metre there too. Fearing I may be near my luggage limit thanks to all my fabric purchases I called it a day and thus ended my fabric journey of Vietnam. Vietnam is a great place to visit and if you go on a fabric search, don’t forget to experience everything else the place has to offer too! I’ve put an album of pictures from the markets and shops on my Facebook page, check them out here. Now, where to next hmmm……. Vietnam is at the top of "must visit" list, and now you're only giving me more reasons to go! Buying silk directly from where the little wee worms make it? GET ME ON A PLANE IMMEDIATELY! Thanks for this list! I'm sure it will come in handy. I hope you get there one day - its a great place to visit, A-MAZ-ING food and the fabric you can see...there's a lot! Hi Ian, I found the tailors over in Vietnam are pretty much happy to sew up something out of any kind of material. They wont turn your daughter away! Oh. My. Word! How did you not send a cargo container home with just fabric. 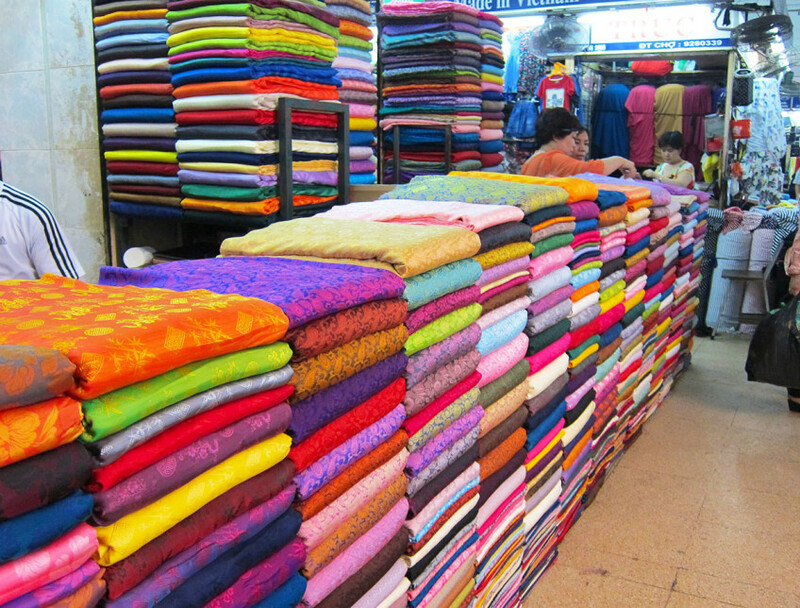 We had a great time fabric shopping in Langkawi (just one store as it's a small place) mainly as noone hassled as to buy anything...it's so unlike anywhere else I've been in Asia and it was GREAT! It was very hard to not being home twice as much, I tell you! You are so lucky. All that beautiful fabric - how stunning. Would love to see the dress you had made. I have just arrived in Vietnam and very excited about having some clothes made. I would like a rather funky two peice made for festivals and wondered whether you managed to source or seen any holographic/ lamé/ iridescent/ sequin materials whilst away? I need to revisit beautiful Vietnam as I last did so 6 years ago, and left part of my heart there...I am very keen to have silk kaftans made for ladies wanting classy, original attire. I am an artist and art therapist and plan to host workshops with quality fabric art materials that participants can use on their own kaftan. My workshops are all designed to teach and share self-empowering strategies which enhance inner beaUty. EDUCATING the HEART thru ART. I choose Vietnamese silk because whilst walking through the streets of Hanoi or elsewhere, I would often lose my children-all aged under 10 then. On taking a closer look down a little alleyway, they were just being loved and hugged by a gorgeous toothless old lady...again...and again...and again. This is beauty untold, and my vision for change as a mother and educator, is to tell this story of beauty through personalized silk kaftans, so women and girls everywhere can revel in their inner beauty. Please share some thoughts and ideas with me. Hi, is there anyone that can comment on the silk in Vietnam?! I am hoping to find silk similar to the very soft and thin silk I found in India, will it be possible? I m heading to Ho Chi Minh in August and wish to purchase silk for furnishing (curtains) for my daughter in Europe. Can anyone tell me where to go to buy good quality fabric? Hi Anne- sorry for the delay in getting back to you. 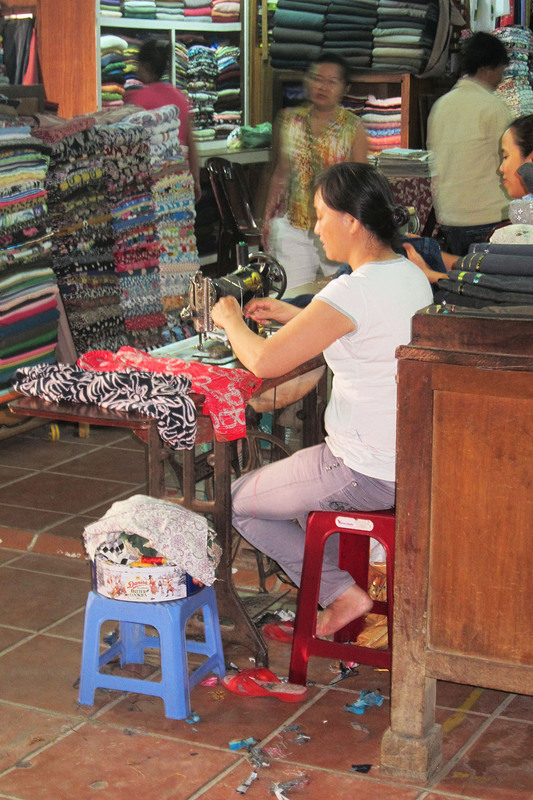 From my experience in Vietnam most fabric is purchased from the markets there including dress and furniture fabric. I'm not sure Vietnam is particularly well known for quality fabric apart from their silk. 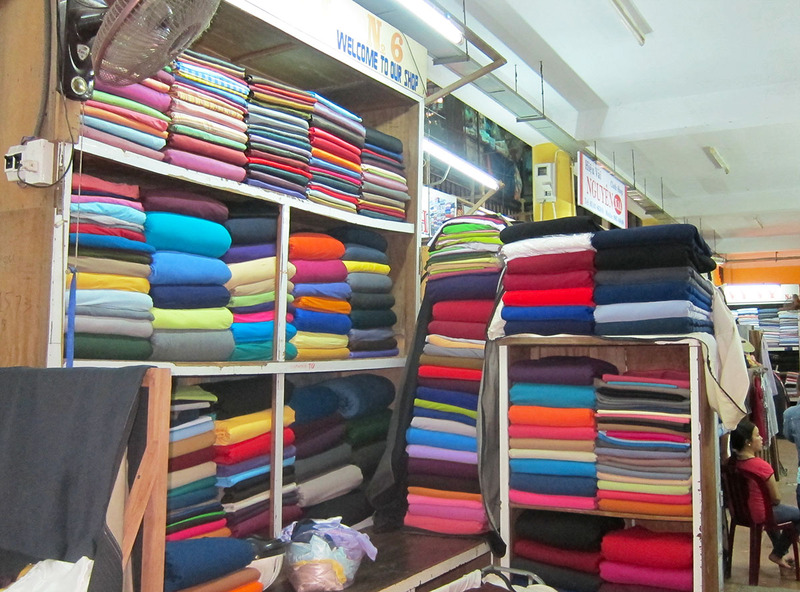 If you are after good quality silk, I'd be going to a shop front in Saigon and not the markets. Have a great time! Hi, someone know if possible to buy fabric from them from usa? Somebody have a contact # or if you know someone there saw and send the item to USA? 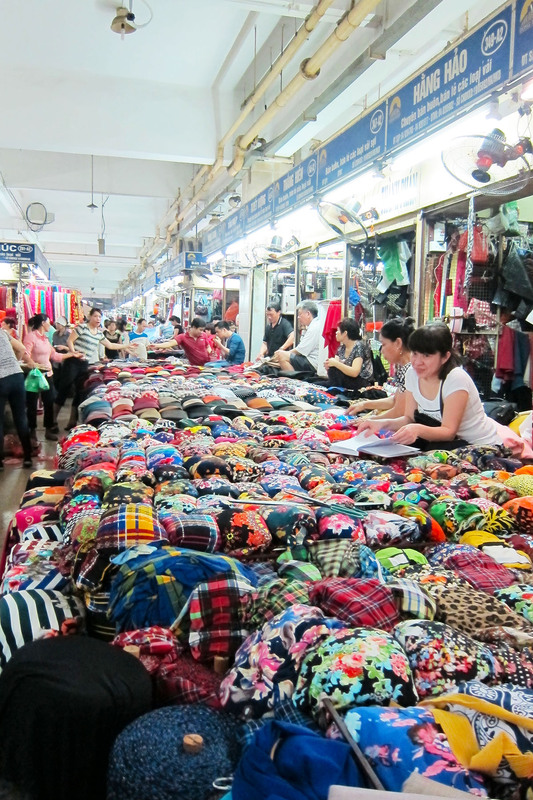 Great insights into the amazing markets and tailors of Vietnam. There truly are some beautiful local products here, and some incredibly skilled individuals. Hi Amy, depends a little on what kind of fabric you want to make kaftans from. 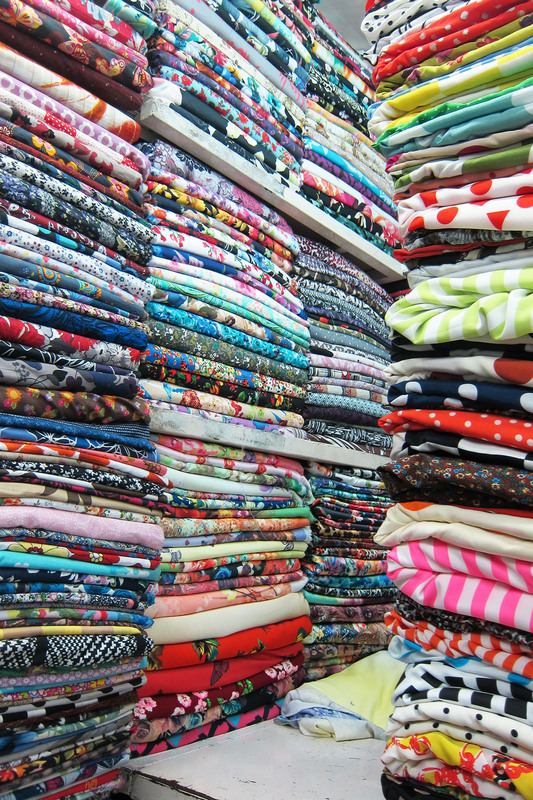 The markets had a lot of rayon and cotton and of average quality - make sure you pre-wash before sewing it up! 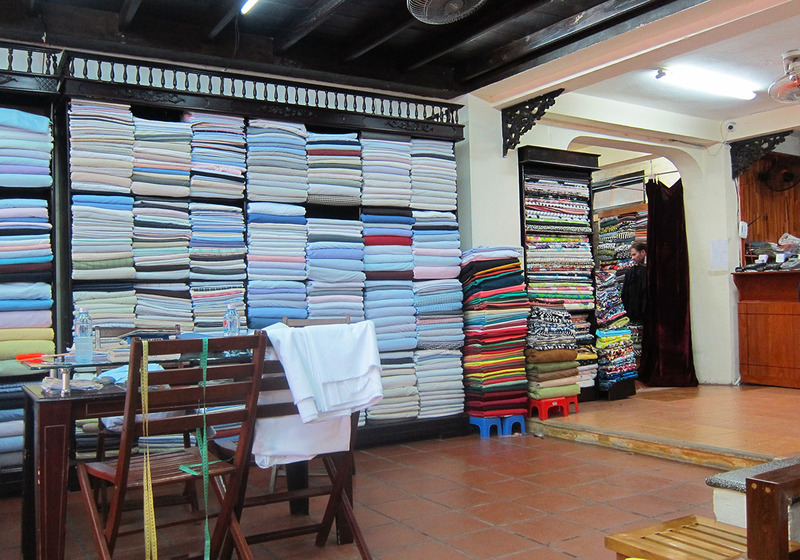 If you are after good quality silk, go into the shops there, particularly the better know tailors in Hoi Ann. Hope that helps! Vietnam is amazing for cloth and tailors. However, my green silk dress, advised to be dry clean only, leaches blue green dye under the arms when it is hot. Dare I gently hand wash it or try fixing it with salt solution. Beautifully made it is s copy of a favourite dress. However blue dyed body is a problem! Hello, I have just returned from Vietnam, I went on. 2 week holiday from Siam Reap Cambodia 7 day cruise along Mekong ending up in Saigon amazing doesn't even describe what we saw, funny enough we went with APT for the cruise an Australian company. The silks are fantastic went to a silk factory watching them weave was incredible, I bought 2 lovely silk tops from the factory, sadly they don't stock that many sizes for women who are bigger than them. I am desparately looking for Vietnamese silk online do you know of any. Hi, I am wondering how accurately they cut the fabric lengths, will I need to buy a bit extra to allow for error? Hi Leonie, from memory I think they are pretty generous with their cutting and don't scrimp. 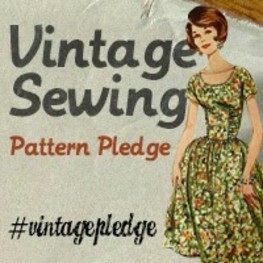 But given the fabric is so cheap there, you may as well get them to cut another 10cm in case you don't have enough! I am going to visit Vietnam. I want to buy silk pyjamas and some other silk products. Where do you recommend to buy the silk and where can find a reliable company to make the products please ? Hi Brian, I had a dress made in Hoi An that I was pretty happy with. Details of the tailor are in the blog post. They also sell silk. 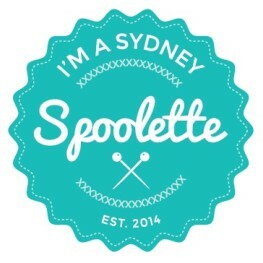 Hi Bec, great post! do you happen to recall how much it cost for silk per meter?